The case was transferred to the Crime branch for a probe by Delhi Police Commissioner Amulya Patnaik. 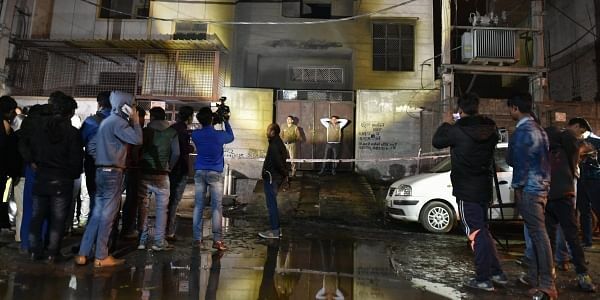 NEW DELHI: A day after a factory fire killed 17 persons in west Delhi's Bawana area, 14 victims were identified and the factory owner arrested on Sunday, police said. Those identified included nine women and five men, Deputy Commissioner of Police Rajneesh Gupta said. They are Baby Devi, 40, Afshana, 35, Sonam, 23, Reeta, 18, Madeena, 55, Rajjo, 65, Sukhda, 42, Khusna, 47, Soni, 21, Suraj, 20, Ravi Kant, 18, Rohit, 19, Sanjeet, 19, and Ajeet Ranjan, 22. Gupta said Manoj Jain, owner of the plastic factory that was also used as a warehouse for firecrackers, had been arrested. He rented it on January 1. Jain was taken into custody on Saturday night after brief questioning as police filed an FIR against him under sections of the Indian Penal Code and the Explosives Act dealing with negligent conduct with respect to fire or combustible matter, culpable homicide not amounting to murder and causing hurt by acts endangering life or personal safety of others. The DCP said an injured labourer claimed that firecrackers were packed in the factory. The fire in the Bawana Industrial Area was reported to the Police Control Room around 6.20 p.m. on Saturday. The victims were trapped in the basement and the first and second floors when the fire spread from the basement. After visiting the spot, Chief Minister Arvind Kejriwal ordered a probe and announced an ex gratia of Rs 5 lakh to the next of the kin of the deceased. He said it will be investigated how a licence was given to the establishment, who gave it and also how the incident happened. Delhi Bharatiya Janata Party (BJP) leader Manoj Tiwari also announced a compensation of Rs 50,000 each to the victims families. Earlier in the day, Delhi Industries and Urban Development Minister Satyendar Jain told reporters that a probe committee has been formed and strict action will be taken after the report is submitted. However, on Sunday, a blame game started as the BJP said the factory licence was issued by the Delhi government since the North Delhi Municipal Corporation had cancelled it in February 2015. "This place, this factory, its licence and everything was with the Delhi government and its Industry Department. It was being run illegally," Tiwari tweeted. Echoing him, BJP MP from New Delhi Meenakshi Lekhi said: "Bawana Industrial Area is a confirmed industrial area of Delhi maintained by the DSIIDC (Delhi State Industrial and Infrastructure Development Corporation) which is responsible to check for the fact that no illegal manufacturing happens in the factories situated there." "In this immediate case of the factory where the fire started, the North MCD had cancelled the licence in February 2015 itself. "The DSIIDC owes an explanation to the people of Delhi on how the factory was running," she said. Tiwari also attacked Kejriwal after he retweeted a video of North Delhi Mayor Preeti Agarwal where she is seen cautioning officials not to say anything on the tragedy. Kejriwal on Saturday night retweeted a video wherein Agarwal is heard saying: "The licence of this factory is with us. That's why we cannot speak on the issue." Tiwari took to Twitter and wrote: "What can be more shameful than this, where 17 people have lost their life and the Chief Minister is retweeting a false video." The North Delhi Mayor told the media: "I only made some inquiry about the place from my co-workers and I meant we shouldn't say anything about such an unfortunate incident at this time." The Mayor demanded an apology from the Chief Minister. Meanwhile, the Congress demanded a judicial probe into the Bawana factory fire. "We demand a judicial inquiry into the fire in Bawana industrial area in west Delhi on Saturday evening since the magisterial inquiry ordered by the state government is meant to save its own departments. We also demand the judicial inquiry for a fair probe," Delhi Congress chief Ajay Maken told reporters after visiting the spot in west Delhi. The former Union Minister also condemned Agarwal for what he called her "insensitive statement".